The grade 4s, all new to DAREarts, learned to use inner discipline, teamwork, and empathy to work together effectively, which is a big dare for nine-year-olds! 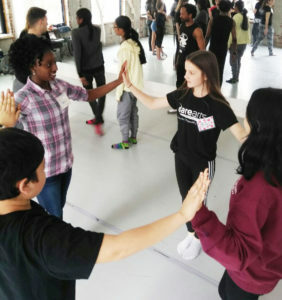 They shared their DAREarts journey through global history, showcasing an Afro-Cuban dance, a scene from Romeo and Juliet, a song they wrote together about collaboration, and their Da Vinci-inspired watercolour self-portraits. The grade 5s learned bravery, the power of kindness, and the importance of taking action through their DAREarts experience. 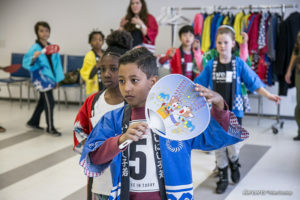 They shared Baroque song and dance pieces, a Bharatanatyam dance, Commedia dell’Arte character skits, and pop-up artworks inspired by early children’s literature. 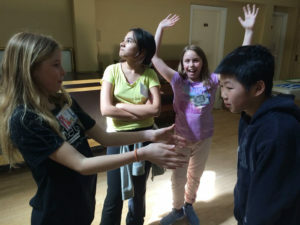 The grade 6s discovered the importance of supporting one another and recognizing how their unique talents helped them to grow as a team of young leaders. They performed their ballet choreography, stage combat choreography, several opera arias they had written together in groups, and displayed their Impressionist-inspired landscapes and Gothic-inspired clay gargoyles. The grade 7s found that each DAREarts Day offered a new way for them to grow as leaders and discover new ways of creative thinking. 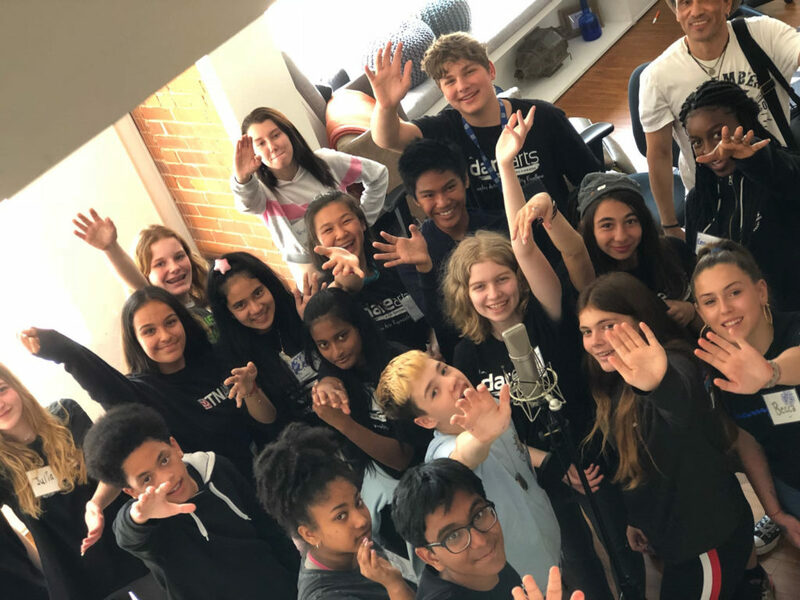 As each day went by, they discovered so much joy in collaborating, improving their time management skills, and how much they looked forward to performing together as a team. They boldly showcased their Afro-Contemporary choreography, improvised scenes, African drumming, the song “Every Day I Have the Blues”, a catwalk of decade-inspired fashion creations, and a display of their lino block prints inspired by 20th Century Canadian art. On Wednesday, June 6th, the Cambria Gallery generously hosted a special graduation celebration for our grade 8 class. During their DAREarts Days, these delegates explored 21st Century identity and leadership through music, drama, dance, literature and visual art. Their showcase demonstrated the importance of “leadership with vulnerability” and how both personal and professional relationships can be built on a platform of honesty, understanding, and respect. 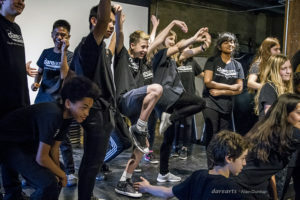 Throughout their showcase of their b-boy/b-girl dance choreography, their slam poetry, the song they wrote together titled “Emotional”, and their identity-focused self portraits hung on the walls, several youths stepped forward and shared moving speeches. It was a brave sharing of how the teens felt nervous about what comes next, but also how they have become empowered through their sense of community, ready to take on this big transition into high school and beyond. Established 22 years ago, DAREarts has a proven track record of empowering at-risk kids to reach their full potential and be leaders. DAREarts has reached over 200,000 kids, providing the leadership skills needed to avoid the pitfalls of drugs, guns and gangs. DAREarts’ success stories include young adults in business, medicine, law and education. 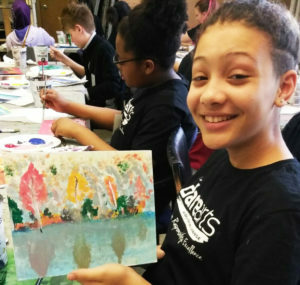 DAREarts is grateful to all its supporters including National Supporter: Northbridge Insurance; Lead Supporters: Anne Livingston, Baton Rouge, Scotiabank, TD Bank Group, Bank of America Merrill Lynch and the Ontario Arts Council; and 2018 DAREarts Toronto Education Partners: Toronto District School Board, TELUS, Wells Fargo, and the Mary Margaret Webb Foundation.